click here Business to the rescue? In recent years, business – especially large Western multinationals who care about their reputation with customers and/or potential employees – have become one of the more progressive forces in society, at least in terms of promoting inclusivity on gender, race and sexuality, and increasingly (outside of the carbon-based industries) on seeking solutions to climate change. If the Trump administration is determined to lead the world into a turn-back-the-clock Regressive Era, much will depend on whether today’s mainstream business executives step in to fill the Progressive leadership void. The worry is that, fearful of a public Presidential Twittering, they will instead conclude that discretion is the better part of valour and stay away from anything potentially controversial. The good news is that lately a few more enlightened business leaders have joined Paul Polman, the CEO of Unilever, in making a public stand for building a more inclusive and sustainable society. They include Marc Benioff of Salesforce (on issues ranging from homelessness to LGBT rights); Hamdi Ulukaya of Chobani (refugees); Emmanual Faber of Danone (which is experimenting with how to turn a large public company into a mission-driven B Corp) and Larry Fink of BlackRock, the world’s largest fund management company, who is leading efforts on long-termism and impact investing which may be especially significant. If the capital markets can become active supporters of company bosses who do stand up for social progress, then they are far more likely to do so. Making the profitable achievement of social progress, rather than maximising short term profits, a core part of mainstream investment behaviour is an urgent challenge for 2017.
buy now It’s the climate, stupid The top priority for the new resistance movement is likely to be stopping the Trump administration destroying what had been an increasingly concerted global effort to combat climate change. Here, enlightened business leaders and investors will have an especially important role to play. So will state and city governments, which can implement policies based on very different assumptions than those of the federal government about the threat of climate change. Finding ways to convince a sceptical public that climate change science is reliable will be essential. The American legal system may prove crucial in this, as efforts accelerate to prove that oil companies knew of the risks of climate change but deliberately set out to suppress the evidence and mislead the public. With ExxonMobil now being pursued in the courts by several state attorneys general, 2017 could be the year when Big Oil starts to experience the kind of massive fines and widespread stigma that was hitherto reserved for Big Tobacco. https://mediaspectrum.net/healthcare/ generic viagra without a doctor prescription Fighting fake news There will be a vigorous philanthrocapitalistic effort to fight the plague of “fake news” that has been credited in part for Trump’s win. Facebook and Google algorithms will be scrutinised and attacked for their ethical lapses. Foundations and other values-driven investors may threaten to divest from companies whose advertising dollars support fake news creators. One leader of this campaign will be one of the fake news movement’s most prominent targets: as well as launching the Barack and Michelle Obama Foundation, Trump’s predecessor in the White House is said to be mulling creating some sort of media-focused entity committed to restoring integrity to news. CRSPR, ISIS, Data for Good & Refugees This year, we expect to see leading philanthrocapitalist thinkers wrestle with the implications for society of the powerful new gene editing technology, CRSPR; with what the private sector can do to beat terrorist threats such as those posed by ISIS; with how the increasing volumes of Big Data produced by private companies, especially the giant internet platforms and smart phone operators, can be used for public good; and whether private philanthropy can help the traditionally government-dominated system of helping refugees do a far better job (a theme that will be central to the big UN Humanitarian Summit in Istanbul in May). Trumping Trump In a presidential election year, there will be more talk of plutocracy in America than since the days of JD Rockefeller. In some ways, this will be an opportunity for billionaires more generous in spirit (and cash) than The Donald to prove the sceptics wrong by putting their money behind the causes he opposes, from helping refugees and providing a path to citizenship out of illegal immigration to finding a more positive role for America in the world. It should be a chance, too, to debate how philanthropy and social entrepreneurship can better work with government (though we don’t have much hope that debate will happen). Instead, expect lots of talk about Big Philanthropy versus The People. However well-intentioned, philanthropy by the rich will be increasingly embroiled in a heated debate about inequality and the role of wealth in society. There will be lots of talk about the allegedly pernicious power wielded by Big Philanthropy over the democratic process. Foundations and other rich donors will need to work hard to demonstrate they are clearly delivering public benefit and working to empower The People, not undermine them. In short, the pros and cons of philanthrocapitalism will be an even hotter topic than this year. CGI RIP? If Hillary takes the White House, there will be huge pressure to close the Clinton Global Initiative and maybe even the Clinton Foundation, or to radically change the governance of what has been called the Clinton Charity Empire, perhaps to something equivalent to a philanthropic blind trust. No one should want the CGI to disappear, as it plays a valuable role in the world of philanthrocapitalism by bringing together donors, big companies and social entrepreneurs. Nor should anyone want Bill Clinton to stop playing his catalytic role in this match-making process. Yet it would be unprecedented for the leader of the world’s superpower to have such close ties to a philanthrocapitalistic outfit of this nature, and those who care about its future need to devote serious effort right away to figuring out a credible path for it to continue under a President Hillary. Will the Kochs Still Love Soros? This will be a testing year for the unlikely romance that has broken out between philanthropic bogeymen of the right and left over prison reform in America. The Koch brothers and George Soros, among others, have been making common cause over the absurdly high levels of incarceration in America, Soros out of concerns about the injustice of it all, the Kochs from a dislike of big government and a genuine libertarian contempt for needless restrictions on personal freedom. Will the demands of an election season, which will see their bogeyman status taken to new heights, cause their positive new relationship to fracture? Let’s hope not, as the emerging bipartisan consensus on the need for prison reform is one of the more encouraging developments in American politics. What gets philanthrocapitalists out of bed in the morning is the subject of a couple of fine books. Can’t Not Do: The Compelling Social Drive That Changes Our World by Paul Shoemaker, an early employee of Microsoft and founder of Social Venture Partners International, draws on his many years as a venture philanthropist. He examines what motivates changemakers to refuse to settle for the status quo in a way that is wise, passionate and practical. Jenny Santi, a leading philanthropy advisor, has interviewed philanthropists rich and not so rich to find out why they give. Her conclusion, engagingly described in The Giving Way to Happiness, is that it tends to make them happier. Both books are the perfect way to recover your idealism after playing too many games of Cards Against Humanity. Two other enjoyable, practical memoirs from people who have been working for change in hard places come highly recommended. Doing Good Great: An Insider’s Guide to Getting the Most Out of Your Philanthropic Journey by Doug Balfour provides excellent tips from someone who has advised a range of donors and philanthropic organisations as a consultant at Geneva Global. I Am Because You Are: How the Spirit of Ubuntu Inspired an Unlikely Friendship and Transformed a Community is a much tougher, harder hitting book than its feel good title might imply. Jacob Lief, its principal author, levels some fierce criticism at charitable foundations and the short-termist, risk averse ways they tend to give – criticisms that are privately shared by many other social entrepreneurs. You can watch an interview Matthew did with him about the book here, and hear a podcast he recorded with Matthew here. Battle of the Goals Expect a mighty struggle over what should be included in the so-called “Sustainable Development Goals” that will be adopted by the United Nations in September. In The Economist, Matthew predicted that some politicians will want lots of goals covering every possible need, whilst representatives of the business community and impact-focused philanthropy will argue for a narrower set of the most meaningful and achievable goals, around which the world’s doers can coalesce. Our guess? The SDGs will be broader than the MDGs, and more politically correct (decrying widening income inequality, for example), but a real, shorter shadow list of goals will be determined at a meeting of finance ministers in July in Addis Ababa, where money will be made available to achieve some, but not all, of the SDGs and the many more sub-targets associated with them. Philanthrocapitalists should focus their attention on that meeting in July. Climate Heats Up There will be a deal on tackling climate change at the Paris inter-governmental meeting in December. But it will not be one that convinces many people it will do the trick. Expect green philanthrocapitalists to pursue more strategies that try to influence governments or bypass them altogether. In particular, efforts will intensify to convince institutional shareholders to either divest from carbon fuel businesses, or, arguably better, to use their ownership stakes to get firms to adopt business practices that do less harm to the planet. Despite the falling price of oil, some technological breakthroughs will encourage hopes that renewables can replace carbon fuels sooner rater than later. Inequality and Jobs The rapid increase in the income and wealth of the super rich soared up the global agenda in 2014, thanks not least to Thomas Piketty’s best seller, “Capital in the 21st Century”. The debate over what to do about it will intensify this year. There will be more scary stories about technology destroying jobs, and calls for the sort of “inclusive capitalism” that delivers genuine social progress (as measured by the Social Progress Index). It will start to become clear if the efforts led by the OECD to crack down on tax dodging by big business and wealthy individuals have teeth. There will be growing pressure on the more enlightened members of the “1% of the 1%” who have embraced large scale philanthropy to demonstrate that their giving is not just putting lipstick on a pig, but really makes a significant difference. Bitcoin and Drones For Good In 2015, crypto-currencies and remotely operated flying vehicles will be the height of fashion in Silicon Valley. This enthusiasm is likely to spill over into the philanthropy of the growing army of tech billionaires. Does Bitcoin offer a new way to cheaply transfer funds to needy people in far flung places? Can drones help provide storm damage insurance cheaply to subsistence farmers in Africa, or protect the peace in strife-torn countries? This year, we may start to find out. African Philanthropy Rising Just as Mo Ibrahim did a decade ago, a new generation of home-grown African billionaires will start to scale up their philanthropy. They will include Tony Elumelu and Aliko Dangote of Nigeria and the East African 33-year-old billionaire Ashish Thakker, alongside signatories of the Giving Pledge such as Patrice Motsepe of South Africa. Whereas Mo Ibrahim’s cause has been better governance in Africa, these new African philanthropists may be more focused on promoting entrepreneurship across the continent, along the lines of the recently launched Tony Elumelu Foundation Entrepreneurship Programme. 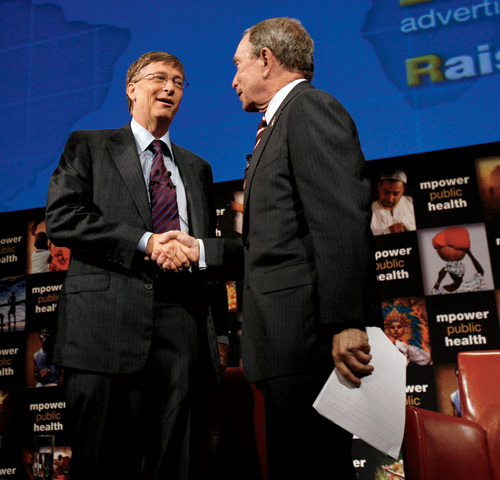 Michael Bloomberg versus Bill Gates No longer mayor of New York, and no longer seriously considering a run for president, Michael Bloomberg is now free to challenge Bill Gates for the title of world’s best philanthropist. This is exactly the sort of titanic competition that philanthrocapitalism needs – friendly, as the two men often partner to do good works, but nonetheless real. Expect him to focus on ending smoking, gun control and, especially, making the world’s cities the leading places where big problems get solved. New York versus London From charter schools to the High Line park, Mr Bloomberg partnered with philanthropy to help him improve New York. Bill de Blasio, his successor in City Hall, campaigned as the “anti-Bloomberg”, advocating traditional left-wing, big government solutions. All eyes will be on whether he actually intends to govern that way, and what that might mean for the well-being of New York. Meanwhile, now that Mr Bloomberg, a big fan of London, is footloose and fancy free, if Mayor Boris Johnson is really as canny as they say, he will ask him to give his metropolitan philanthropy a whirl there. Impact investing’s big year Around the world, there are said to be 100 social impact bonds in the pipeline for 2014, which could make it a breakthrough year for impact investing. In September, the G8 taskforce on social impact investing led by Sir Ronald Cohen (of which Matthew is a member) is expected to propose some bold ideas to advance the field. Look out too for a joint initiative by some of the billionaire signatories of the Giving Pledge to use their money to build impact investing as an asset class. Etsy versus Warby Parker Will the artisan marketplace or the affordably cool, humanitarian specs maker be the first hot B Corp IPO? Will investors warm to shares in firms with the legal right to put their social mission before profit maximisation? We think Etsy will prove the answer is yes. Is the B Team an A team? 2014 is the make or break year for Sir Richard Branson’s effort to forge a group of business leaders into a team of activists dedicated to making capitalism truly sustainable. A new chief executive will have to devise a credible strategy and execute it. Will herding corporate top cats be any easier than herding the regular feline variety? Here’s an idea for them: ethical sourcing from transparent supply chains strikes us as an issue whose time has come, after the deadly collapse in 2013 of clothing factories in Rana Plaza, Bangladesh. The B Team should embrace this cause. The Business Solution to Poverty: Designing Products and Services for Three Billion New Customers by Paul Polak and Mal Warwick. If you believe that business rather than government aid offers the best route for the world’s poor to escape from poverty, this is the book for you. Full of practical advice for entrepreneurs looking to serve the billions of potential customers living at the bottom of the economic pyramid. I Am Malala: The Girl Who Stood Up for Education and Was Shot by the Taliban, by Malala Yousafzai with Christina Lamb. In her own words, the horrifying and inspirational story of the young woman who really should have won the 2013 Nobel Peace Prize. The Generosity Network: New Transformational Tools for Successful Fund-Raising. Private-equity philanthropist Jeff Walker and Harvard academic Jennifer McCrea have written a stimulating practical guide to how to inspire and leverage your network to achieve social good. Just Business: Multinational Corporations and Human Rights, by John Ruggie. An important book on an important topic, by the man who has been guiding the UN’s business and human rights work. As Unilever boss Paul Polman describes it, the book is a “true master class in the art of making the impossible possible”. 40 Chances: Finding Hope in a Hungry World. Warren Buffett’s son, Howard, has turned a career in farming into a philanthropist’s passion for solving the global hunger crisis. He and his son Howard Jnr (plus a forward by Warren – three Buffetts for the price of one) have written a hard-hitting but positive book, spelling out the scale and causes of this deadly problem and what needs to be done to solve it. We particularly enjoyed this insider perspective on an issue increasingly getting the attention of donors, activists and big business. Richer Lives: Why Rich People Give, by Beth Breeze and Theresa Lloyd. A fascinating study of 80 wealthy British donors and the people who work with them on their giving. Ideal reading for anyone planning to engage with a rich donor. Mission in a Bottle: The Honest Guide to Doing Business Differently – And Succeeding, by Seth Goldman and Barry Nalebuff. The founders of Honest Tea tell their story and share their insights into how to build a mission-driven business. This is a business book with a difference: it takes the form of a comic book, illustrated throughout by Sungyoon Choi, which makes for an especially easy read as well as an inspiring one. The Idealist: Jeffrey Sachs and the Quest to End Poverty, by Nina Munk. This controversial look at the work of one of the world’s most influential public intellectuals on tackling poverty should be read by everyone who cares about aid and development. Munk draws some conclusions that are extremely negative – unfairly so, fans of Sachs will contend. Read it, and decide for yourself. From the Margins to the Mainstream: Assessment of the Impact Investment Sector and Opportunities to Engage Mainstream Investors. Admittedly, a drily-written report by the World Economic Forum rather than a book, but this is an essential read for anyone interested in how to turn the mainstream capital markets into an unequivocal force for good. Lean In: Women, Work & the Will to Lead. Yes, it was overhyped and self-promotional, but Sheryl Sandberg, the COO of Facebook, has written a timely and much needed analysis of the economic status and potential of women that rightly challenges all of us to do more. Revised edition of the year. In 2013, Connor O’Clery published an updated edition of The Billionaire Who Wasn’t: How Chuck Feeney Secretly Made and Gave Away a Fortune. The original book was brilliant; the revised edition includes the remarkable, often painful and utterly gripping story of the efforts by the “James Bond of Philanthropy” to wind down the Atlantic Philanthropies. Don’t miss it. New York is often described as the World’s Capital City, primarily because it is the headquarters of capitalism. Certainly this week, the last full week in September each year, as hundreds of leaders and thousands of their flunkeys gridlock Manhattan, it is easy to believe that this is the global capital – though what is bringing them to town is not capitalism so much as philanthrocapitalism. Ten years ago, the annual September gridlock was due to a rather narrow, closed affair. Heads of state would deliver long, impotent speeches listened to by nobody at the United Nations General Assembly. Now, what happens in the UN HQ is a relatively small part of what we call Philanthrocapitalism Week. Since 2005, the annual meeting of the Clinton Global Initiative has been a magnet for businesses and non-profits, a philanthrocapitalistic marketplace with an emphasis on making explicit commitments to take action to tackle global problems. This year, as we predicted, the CGI has been revitalised by the addition of the females of the species, Hillary and Chelsea, to leading roles alongside the former president. Barack Obama will be there, as will the other famous face of “Billanthropy“, Bill Gates. More recently, the global public has been given a voice in New York through the Social Good Summit, the brainchild of our old friend and new power guru, Henry Timms. The highlights of this year’s sold-out Social Good Summit, which is being live-streamed here, include talks by Malala Yousafzi, shot by the Taliban because she dared to go to school, actress Charlize Theron, Melinda Gates, World Bank president Jim Kim, Lauren Bush Lauren, Kumi Naidoo of Greenpeace, former vice president Al Gore, Richard Branson and Paul Polman, the sustainability-crusader boss of Unilever, plus moderating by Matthew (who will also be playing a similar role at the CGI). And then there are a growing number of side events just in case the visiting leaders have left a few minutes of their day unfilled. Even before the week began, the UN Global Compact brought hundreds of corporate bosses to its Global Leaders Summit. Louise Blouin is hosting her always-stimulating Creative Leadership Summit. And if that isn’t enough, there is also Climate Week (fittingly, given the amount of hot air expected this week in Manhattan). At the UN, the headlines are likely to be made by the continuing efforts to respond to the horrific events in Syria, as well as an expected post-Ahmadinejad charm offensive by Hassan Rouhani, the new president of Iran. But for most people involved in Philanthrocapitalism Week, top of the agenda will be figuring out what new global targets should be adopted to follow the UN’s Millennium Development Goals, which expire in 2015. We are looking forward to hearing lots of good ideas, most of which we predict will involve partnerships between governments, multilaterals like the UN, business, non-profits and civil society. As we have said before, this is the age of the posse, when global problems are tackled by ad hoc coalitions of the positive. If this new approach is to work, for-profit companies and investors will have a big role to play. Hopefully, this week will see lots of practical discussion of how to make this happen. Two new reports suggest that this debate is at a critical juncture. The World Economic Forum has published an excellent study of how “impact investing” could play a huge role in funding a better world. On the other hand, a survey conducted every three years by Accenture of bosses of companies that have signed the Global Compact, found evidence of “sustainability fatigue” in corporate boardrooms. We have no doubt that the leaders gathered this week in New York will talk the right talk. We will be watching closely for evidence that they are willing to take the hard steps necessary to walk the walk.